Read stories about Rum of A Wardrobe of Whisky blog. Oh man! I hate my work. 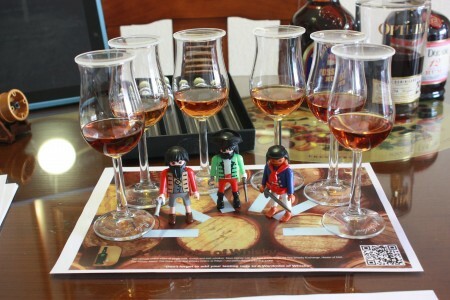 I was there working on the webpage and tasting some delicious whiskies when I got an email from Jean-Marie asking me if I want to join them in tasting blindly some rums. Oh my God, such a problem! Who would want to taste such pesky liquor distilled for pirates to support their pesky living conditions. Of course I couldn’t but to accept such a wonderful invitation! And so here I am with six samples of rum. I just hope they are not cheap mainstream blended rums. Ummm! The delights of blind tastings! After several weeks wanting to taste it I finally have the chance. Rumbullion is a rum liqueur made by Professor Cornelius Ampleforth and bottled and sold by the chaps at Master of Malt. So taking as a base a good dark rum they have added orange peels, clove, vanilla and cinnamon to obtain this drink. Excited? You are right. This drink is a cracker. So good in fact that I have done myself the experiment with two bottles of Laphroaig 10 years old Cask Strength. I will write about this crazy experiment of my later. A sure-fire hit from Professor Cornelius Ampleforth, Rumbullion! is a cockle-warming spiced concoction, based on the kind of rich, full-bodied rums the seafaring fraternity would have enjoyed centuries ago. At the core of this fabulous winter warmer lies a blend of the very finest high proof Caribbean rum, to which was added creamy Madagascan vanilla and a generous helping of zesty orange rind. A secret recipe was followed, and the Professor finished his hearty tipple with a handful of cinnamon and cloves and just a hint of cardamom. Nose (88): strong. sweet, vanilla, brown sugar, lemon, cinnamon. Palate (86): smooth, powerful, oily. sweet, cardamon, vanilla, cloves, ginger, cinnamon, burnt sugar. Finish (86): average. cloves, cinnamon, brown sugar, lemon. So based on other whiskies I have already tasted I rate this Rumbullion with 87 points over 100. To be labeled rum in Guatemala the spirit must be distilled from fermented virgin sugar cane honey, a dark sweet syrup made from freshly squeezed sugar cane juice. The virgin sugar cane honey, as it is called in Guatemala, is made by filtering fresh sugar cane juice and then boiling off the water until the syrup contains about 72% sugar. Only sugar cane grown in Guatemala is used to make this virgin sugar cane honey since it would be impossible to transport cane cut in another country to a Guatemalan sugar mill. Ron Zacapa represents the pride of Guatemalan rums, the pride of closely guarded recipes known only to skilled master blenders, and the pride of a government that strictly mandates the aging process. Guatemalan Rum must be made of "cane honey" which is essentially cane juice concentrate. They do take care to prevent caramelization, which would create a molasses. Nose (88): more than average. sugar cane, floral, brown sugar, citrus. Palate (91): smooth, oily, powerful. brown sugar, burnt sugar, floral, sugar cane, cinnamon, wood. Finish (90): long. brown sugar, cinnamon. So based on other whiskies I have already tasted I rate this Ron Zacapa Solera n�23 with 90 points over 100. Venezuela produce some high quality rums thanks to its geographic and climatic factors and because the exceptional characteristics of the raw material: the sugar cane. Brown rum distilled from fermented molasses. Aged 3 to 10 years in used whisky and bourbon barrels. Nose (84): more than average. sweet, brown sugar, sugar cane, alcohol, grapes, floral. First nosing data is innacurate as the previous tasting sheet lacked of this field. Palate (88): smooth, powerful. sweet, brown sugar, floral , burnt sugar, sugar cane, alcohol. Finish (84): longer than average. brown sugar, sugar cane. So based on other whiskies I have already tasted I rate this Santa Teresa Ron Selecto with 85 points over 100. Master of rums and the flagship of the house, Santa Teresa 1796 results from a careful blend of Santa Teresa�s finest aged spirits ranging from 4 to 35 years that is then further aged in a style borrowed from the Spanish sherry producers. Santa Teresa 1796 is the first premium a�ejo rum in the world to be aged in the Solera method: a cascade process in four levels of oak barrels that combines barrel ageing and cask "crianzas." 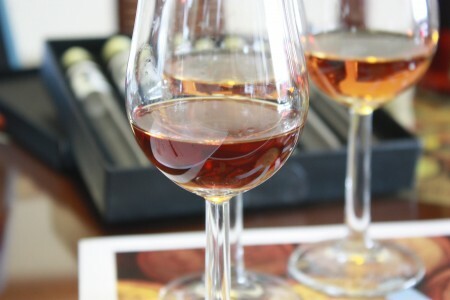 The blend of a�ejo (aged) rums enters the top barrels and is aged until it reaches a desired level of maturity. Half of the contents of the top barrels are then transferred to the oakbarrels below that have also had half of their contents removed and transferred to the barrels below and so on until the fourth set of barrels. When the cascade is concluded, the golden liquid is transferred to large Limousin oak casks that, again, are only ever half emptied thus producing even softer and rounder rum. This system is unique in Venezuela and the Rum industry. Palate (92): smooth, oily, powerful. brown sugar, sugar cane, burnt sugar, wood, spices, vanilla. So based on other whiskies I have already tasted I rate this Santa Teresa 1796 Ron Antiguo de Solera with 91 points over 100. A rum liqueur, Rhum Orange is the perfect blending of the finest rums aged for at least 2 years with an exquisite orange peel maceration. With its splendid golden amber color, its fragrant aromas reveal the scent of oranges. Fantastic after a meal on the rocks or blended in cocktails. Substitute for Triple Sec in your next Margarita! Nose (84): more than average. orange, brown sugar, sugar cane, cinnamon. First nosing data is innacurate as the previous tasting sheet lacked of this field. Palate (88): smooth, oily, powerful. sugar, oranges, hot, sugar, brown sugar. Finish (84): longer than average. oranges, brown sugar. So based on other whiskies I have already tasted I rate this Santa Teresa Orange Liqueur with 85 points over 100. The fertile banks of the Demerara River were cultivated by indigenous inhabitants long before European planters arrived in the 16th century. In the 17th and 18th centuries, more than 200 plantations produced sugar and rum in Demerara county. Demerara sugar was much sought after while the rum became one of the key ingredients in the Royal Navy Rum which came to be known as Pusser’s Rum. Palate (81): light, powerful. sugar cane, burnt sugar, floral, toffee. So based on other whiskies I have already tasted I rate this El Dorado 3 year White Rum with 81 points over 100. A recent addition to the El Dorado range of splendid golden Demerara rums from Guyana, this brilliantly versatile rum works well in a luxury Mojito or Rum Old-Fashioned, but is also delicious on the rocks or sipped slowly. A terrific all-rounder. Nose (85): strong. sugar cane, floral, burnt sugar, toffee, a bit banana. Palate (87): oily, powerful. sugar cane, floral, burnt sugar, citrus, peaches, wood, a little cinnamon. Finish (87): long. burnt sugar, sugar cane. So based on other whiskies I have already tasted I rate this El Dorado 8 year with 86 points over 100. An absolutely brilliant 12 year old Demerara rum from Guyana, that uses the Port Morant double pot still as the lead spirit. This wins oodles of awards including the the gold medal at London's Caribbean Rum Taste Test. We cannot recommend this sipping rum highly enough. Nose (86): strong. floral, sugar cane, toffee, a little wood, banana. Palate (89): smooth, oily, powerful. sugar, brown sugar, floral, sugar cane, banana, wood. Finish (87): long. brown sugar, sugar cane, a little floral, wood, cinnamon. So based on other whiskies I have already tasted I rate this El Dorado 12 year with 87 points over 100. That is how the Beverage Tasting Institute of Chicago summed up their appreciation of El Dorado 21 Year Old Special Reserve. Designed for true rum connoisseurs its warm subtlety is best savoured slowly on its own � and shared with a few very special friends. Nose (88): strong. brown sugar, sugar cane, floral, a little wood, a little cinnamon. Palate (92): smooth, oily, powerful. brown sugar, sugar cane, floral, spices, wood, mango. Finish (87): long. brown sugar, sugar cane.. So based on other whiskies I have already tasted I rate this El Dorado 21 year Special Reserve with 89 points over 100. On the Atlantica ocean there are also other rums producers. Mainly in Bermuda islands and Canary islands. Palate (83): smooth, oily. brown sugar, sugar cane, custard, cinnamon, burnt sugar, floral, vanilla, a little oranges. Taste like Crema Catalana, a typical Spanish kind of custard. So based on other whiskies I have already tasted I rate this Gosling's Black Seal with 83 points over 100. Palate (80): light. brown sugar, alcohol, wood, floral and something like toasted wood. So based on other whiskies I have already tasted I rate this Arehucas Oro with 75 points over 100.